PeopleGoal | What is employee performance management? Employee performance management: Just what is it? PeopleGoal Blog > Employee performance management: Just what is it? One can split the employee performance management process into four main stages: Planning; Assessment; Recognition and Development. The planning stage of the performance management process is intended to set employees achievement goals and determine the expected level of performance for a given role. Within the planning stage, managers may wish to provide the employee with a clear timeline of work completion to make sure the achievement goals are met. By the end of the planning stage, both the employee and management should know what is expected, and the given timeframe. The assessment stage constitutes an evaluation of the employees’ performance; this usually takes place annually. Evaluation is garnered from a collective number of sources: feedback from co-workers and clients; management reviews; previous years’ evaluation and skill assessments. Some organizations may have an employee complete an evaluation of their own performance before comparing it to the official evaluation. This stage is centred around recognizing the employee’s achievements as well as areas that may need improvement. Employee recognition is an integral component of employee retention, motivation, engagement and development. During this stage, management and employees should discuss methods of improvement. Development is perhaps the most challenging stage of employee performance management. The purpose of this stage is to promote, encourage and engender further improvement and development of the employee. One method of development is training, whether it be on or off site. Other methods include coaching and/or mentoring. Regardless of the method, the desirable outcome is enhancing employee strengths, improving employee weaknesses and gearing the employee towards the organization’s needs. Understand the impact of their actions in team and company level. 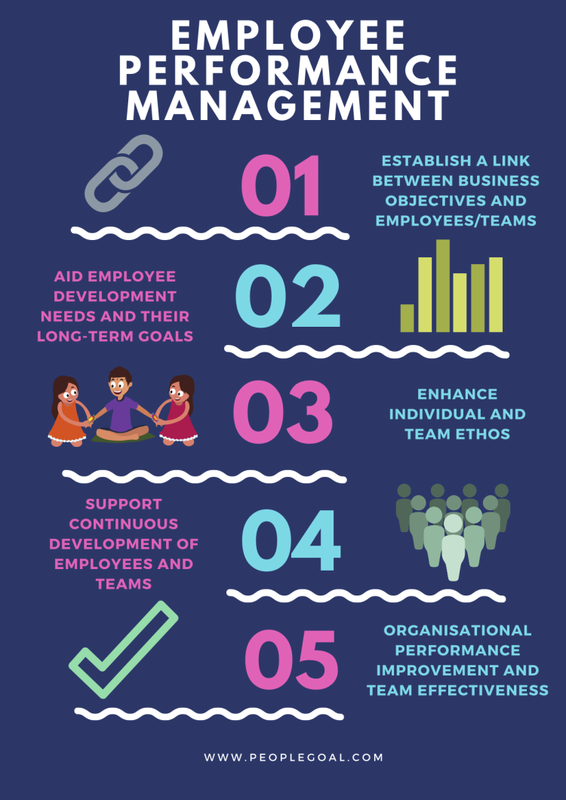 Employee performance management is about establishing a social environment where teams and employees support business growth using their skills. In this environment, managers are able to plan with the help of their employees. They are able to set expectations and discuss what everyone should do to exceed these expectations. The entire process should be about driving employee engagement and team growth rather than just measuring an employee’s performance.